As Congress dithers for the umpteenth time over extending a key subsidy for wind energy, the industry once again is up in the air. Called the production tax credit (PTC), the subsidy helps level the playing field between wind and fossil fuels and has proven to be critical for financing new projects, helping to make wind one of the fastest growing electricity sources in the country. Given the planet needs to transition as quickly as possible away from coal and natural gas to carbon-free energy to avoid the worst consequences of climate change, who would be against renewing wind's tax credit? The Koch brothers, that's who. Charles G. and David H. Koch -- the billionaire owners of the coal, oil and gas Koch Industries conglomerate -- have enlisted their extensive network of think tanks, advocacy groups and friends on Capitol Hill to spearhead a campaign to pull the plug on the PTC. Never mind the fact that the oil and gas industry has averaged four times what the wind tax credit is worth in federal tax breaks and subsidies annually for the last 95 years. The Koch network is fighting the wind industry on a number of fronts. Last month, Koch-funded Congressman Mike Pompeo (R-Kansas) sent a letter signed by 52 House members to the chairman of the House Ways and Means Committee, urging him to let the PTC expire. Meanwhile, a coalition of some 100 national and local groups organized by the Koch-founded Americans for Prosperity sent a letter to each member of Congress asking them to do the same. And earlier this month, the Koch-funded Institute for Energy Research launched an anti-PTC ad campaign and released a report claiming that only a handful of states actually benefit from the subsidy. Malcolm Gladwell didn't include this battle in his new book David and Goliath because, given the odds, it's more like Bambi versus Godzilla. The fact that Kansas Rep. Mike Pompeo is the Kochs' point man to scuttle the PTC in the House is a bit ironic given his state is a wind energy leader. Kansas has the second highest wind potential in the country, it has already attracted more than $5 billion in wind industry investment, and last year wind generated 11.4 percent of its electricity. With stats like that, the industry has broad bipartisan support. Kansas Gov. Sam Brownback and Sens. Jerry Moran and Pat Roberts -- all Republicans -- are big fans. Pompeo, who has been in Congress since only 2011, would argue that he's against all energy tax credits. For the second year in a row, he has introduced a bill that would eliminate tax breaks that benefit oil, natural gas, coal, nuclear, electric vehicles, alternative fuels, solar and wind, including the PTC, which gives wind developers a tax credit of 2.3 cents for each kilowatt-hour of electricity they produce. But there's a catch. Although it appears evenhanded, Pompeo's bill would severely hamper wind and solar but preserve a number of oil, gas and coal subsidies, including the percentage depletion allowance, the ability to expense the costs of exploration, and the accelerated depreciation of certain kinds of "geologic property." These and other tax breaks he left out of his bill would be worth about $12.5 billion to the oil and gas industry from 2011 through 2015, according to a March 2012 Congressional Research Service report. 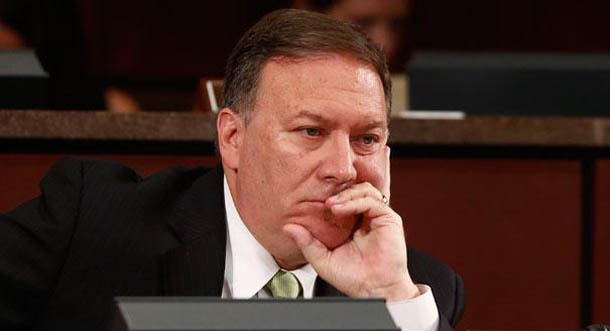 Why is Pompeo so down on wind? Perhaps it's because Koch Industries is headquartered in Wichita, smack-dab in the middle of his district -- and the fact that the company is by far and away his biggest campaign contributor. Since 2010, Koch Industries has given him $200,000, more than four times what his second highest contributor kicked in. Besides Koch Industries, three other oil companies are among Pompeo's top five contributors -- McCoy Petroleum, Mull Drilling and Richie Exploration -- and they're also based in Wichita. What about the other 51 House members who signed Pompeo's letter? As it turns out, 65 percent of them received contributions from Koch Industries during the last two or three campaign cycles, according to Federal Election Commission data compiled by the nonpartisan Center for Responsive Politics. A quarter of them, meanwhile, cashed checks from ExxonMobil. And except for two congressmen who didn't take any energy industry money, the signatories received sizable contributions from a number of other corporations that compete with wind, including coal barons Arch Coal and Alpha Natural Resources; oil and gas giants Chesapeake Energy, Chevron, ConocoPhillips and Valero Energy; and Exelon, which owns the most nuclear reactors in the country. Pompeo's letter came on the heels of a letter from the Kochs' flagship advocacy group, Americans for Prosperity, calling for Congress to kill the PTC. AFP's letter, which was signed by 102 organizations, claims that "the wind industry has very little to show after 20 years of preferential tax treatment" and declares that "Americans deserve energy solutions that can make it on their own in the marketplace -- not ones that need to be propped up by government indefinitely." Is that right? Little to show? Preferential tax treatment? In fact, until Congress left the wind industry hanging late last year, it had been doing quite well. Even with a deep recession and slow recovery, over the previous five years -- with the help of the PTC, stimulus spending and state renewable electricity standards -- the industry doubled its electricity output, employment and private investment. In 2012, domestic manufacturers produced roughly 72 percent of the wind turbine equipment erected across the country -- nearly triple the percentage in 2006 -- and more than 13,000 megawatts of new wind generation capacity was installed. By the end of last year, there were enough wind turbines to power 15 million typical American homes -- without toxic pollutants or carbon emissions. But AFP's complaint that the wind industry has been on the dole far too long is even more galling. What about the oil and gas industry? It's been feeding at the federal trough since 1918! On average, the industry has benefited from $4.86 billion in tax breaks and subsidies in today's dollars every year since then, according to a 2011 study by DBL Investors, a venture capital firm. Renewable energy technologies, meanwhile, averaged only $370 million a year in subsidies between 1994 and 2009. The 2009 stimulus package did provide $21 billion for wind, solar and other renewables, but that support barely begins to balance the scales that have tilted toward nuclear power for more than 50 years, oil and gas for 95 years, and coal for more than two centuries. So who signed the AFP letter? About half of the signatories are local tea party affiliates and anti-wind NIMBY groups of indeterminate size and funding. The other half are, for the most part, relatively obscure national groups, but there are a few that have attracted attention over the years for their contrarian views on climate science and renewable energy. Like AFP, those groups are awash in petrodollars. The American Energy Alliance (and its parent, the Institute for Energy Research), Competitive Enterprise Institute, Freedom Works, Frontiers of Freedom and Heritage Action (and its parent, the Heritage Foundation) collectively have received millions of dollars from Koch family foundations, ExxonMobil and the American Petroleum Institute, the oil and gas industry's premier trade association. On December 3, the Institute for Energy Research and its political arm, the American Energy Alliance, sponsored what they dubbed the "wind welfare" summit in Washington, D.C., featuring IER founder and CEO Robert Bradley Jr., a Koch network veteran. AEA announced it would spend $40,000 on print and digital ads calling for an end to the PTC and is flying in anti-PTC advocates for meetings on Capitol Hill. Bradley presumably highlighted the findings of a report IER released the day before claiming that a small number of states with wind resources -- Iowa, North Dakota, Oklahoma and Texas -- are reaping the benefits of the PTC while 30 states and the District of Columbia are "losing millions" to fund it. The report's findings, however, don't hold up to scrutiny. Mike Jacobs, a senior energy analyst at the Union of Concerned Scientists, pointed out in a recent blog that IER ignored the fact that a number of the states it identified as "net payers" are home to wind industry manufacturing facilities. There are 62 companies in Ohio making turbine components, for example, 40 in Michigan and 21 in California. Jacobs also discovered that IER downplayed the fact that "the PTC benefits consumers where wind-generated electricity adds to the supply and lowers the price of electricity, landowners who receive lease payments from the wind turbines, and local communities that collect tax payments on installed wind farms." Jeff Spross, blogging on the Center for American Progress' ThinkProgress website, also chided IER, pointing out that most industries are not equally distributed across the country. "The oil and gas industries, for instance, benefit from a wealth of federal tax carve-outs," he wrote, "but the economic activity they generate is concentrated in just a few key states." In other words, it's disingenuous to single out the wind industry. While Congress has generously provided the fossil-fuel and nuclear-energy industries a number of permanent subsidies, it has typically granted the wind industry the PTC on a short-term basis and then wavered over renewing it. Last year the PTC expired on December 31, but as part of the "fiscal cliff" budget deal the next day, Congress extended it for the seventh time since it debuted in 1992 -- for only one year. This uncertainty over the PTC's status has put wind developers at a distinct disadvantage, making it difficult to attract investors and plan ahead. Last year's cliffhanger, for example, definitely did a number on the industry. Wind farm construction has fallen off dramatically compared with 2012: Only one utility-scale wind turbine was installed in the first six months of this year. Business picked up somewhat in the third quarter, with 68.3 megawatts installed, according to the American Wind Energy Association, but that's far below the average of more than 1,000 megawatts that the industry constructed in most quarters in recent years. Given that it takes years to plan, finance and construct a wind farm, Congress is again undermining the industry's potential by slow-walking the PTC extension this year. And that potential is tremendous. Wind currently generates about 4 percent of U.S. electricity, but by 2030 it could produce more than 20 percent, according to the U.S. Department of Energy. The DOE's National Renewable Energy Laboratory also is bullish on wind and renewables writ large. Last year, it published a report that concluded today's commercially available renewable technologies could easily generate 80 percent of U.S. electricity by 2050, with nearly half coming from wind. If the Koch brothers and their allies have their way, however, it likely will take a lot longer to get there -- and it will cost a hell of a lot more. Elliott Negin is the director of news and commentary at the Union of Concerned Scientists.